What Happens if You Pay Wrong GST by Mistake? Will You be Penalized? 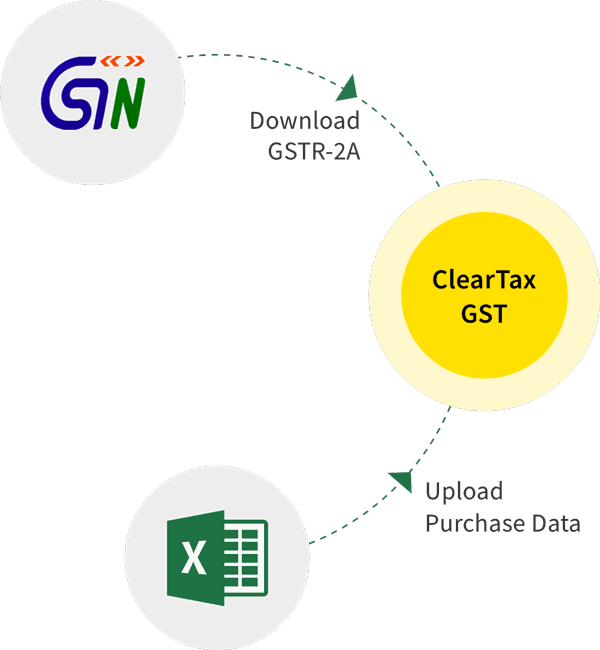 What happens if you collect IGST instead of CGST & SGST? Click here to find out about the penalty in cases where the wrong type of GST is mistakenly paid. The short answer is No. For the long answer, please keep reading. GST is a completely new tax with new concepts like ‘place of supply’ and new tax structures. GST is applicable in the state where the goods/services are consumed i.e., it is a consumption based tax. This can create confusion, especially in certain cases. For example, the seller in Mumbai (Maharashtra) is selling to a buyer in Delhi. Delhi buyer directs the seller to send the goods to Pune (Maharashtra). This is an inter-state sale even though goods end up in the same state, i.e., Maharashtra. But this can be confusing and the tax calculation can be highly prone to errors. Taxpayers can end up paying the wrong GST. So, the GST law has provisions to address these scenarios. Let’s say a taxable person pays CGST/SGST on an inter-state supply transaction which he mistakenly treated as an intra-state supply. i.e., he should have collected IGST instead of CGST/SGST. In this case, the person concerned will have to pay IGST and get the refund of the amount paid as CGST/SGST. This scenario occurs when a taxable person pays IGST on an intra-state supply transaction which he has mistakenly treated as an inter-state supply. Ideally, for an intra-state supply, the tax collected should be CGST/SGST instead of IGST. To rectify the situation, the person concerned will have to pay CGST/SGST and get the refund of the amount paid as IGST. Note: No interest will need to be paid when the taxpayer pays the correct tax later on. Penalty will not apply in these scenarios. These refunds for wrong or mistaken tax calculations will be provided separately to reclaim the tax that has been wrongly paid. The procedure for this is different from the normal refund process of GST. The GST Bill has specifically brought in a new clause mentioning that interest will not be applicable when the correct tax is paid later. Businesses, especially SMEs with fewer resources, will be prone to making mistakes during the initial days while collecting GST. Charging interest on wrong or mistaken tax payment would be unnecessarily harsh as the GST Council believes such errors would be genuine with no intention to evade tax. This clause will bring relief to small entrepreneurs by not charging any interest when they pay the wrong tax by mistake. 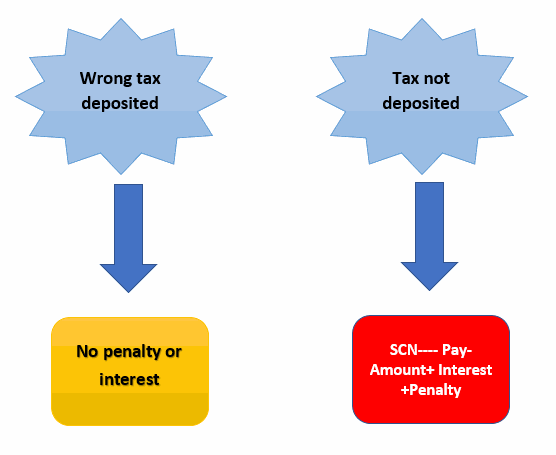 What Happens when Tax is Collected but Not Deposited? Will there be a Penalty? The short answer, in this case, is Yes. Let’s look at the various scenarios in detail. While the law is lenient regarding wrong tax deposits, GST has strict provisions for taxes which have not been deposited after collection. Any person who collects GST is obligated to deposit it to the Centre or State government. This is applicable regardless of whether the supply (on which the GST was collected) is taxable or not. So, a taxpayer cannot collect GST and later claim that as their goods/services were exempt they did not deposit the tax with the respective authorities. No one can enjoy unjust enrichment under any law, including GST. The penalty, in this case, will apply irrespective of any order from any tribunal or court. The proper officer will serve a show cause notice. An opportunity of a personal hearing will be given to the taxpayer if they request it in writing. The proper officer will first issue an order to the concerned person to pay the amount due, along with the penalty. The person has to pay the amount collected as GST and also pay interest on late payment. Interest period will be calculated from the date of tax collection till the date of payment. Interest rates will be prescribed later. The order needs to be issued within one year from the date of issue of the show cause notice. If the Tribunal or court issues a stay order then the period of such stay shall be excluded from the period of one year. If there is any surplus amount remaining after payment of all the dues, then the same will be refunded to the person who bore the amount (i.e. the buyer) or credited to the Consumer Welfare Fund under GST. The buyer can apply for the refund within 6 months of issue of a public notice. Thus we see that the GST law has strict provisions for tax evasion which are concurrent with the government’s stance on tax evasion. However, the government has also kept in mind the fact that GST is new for everyone, and the laws regarding wrong or mistaken tax payment have therefore been drafted with a view to ease the burden of transition and not cause undue stress to the taxpayers. How to file ‘TDS and TCS Credit Received’ on GST portal?